CAMPING SEASON IS ALMOST HERE! Time for your NEW Ice Castle! LARGEST SELECTION IN THE WORLD! #1 Selling RV in the state of Minnesota! 8x24V RodFather XL 8x22V Lighthouse 2200 Honda Generator BEST PRICING GUARANTEED! Financing Available MILACA UNCLAIMED FREIGHT • 1 Mile North of Milaca on Hwy. 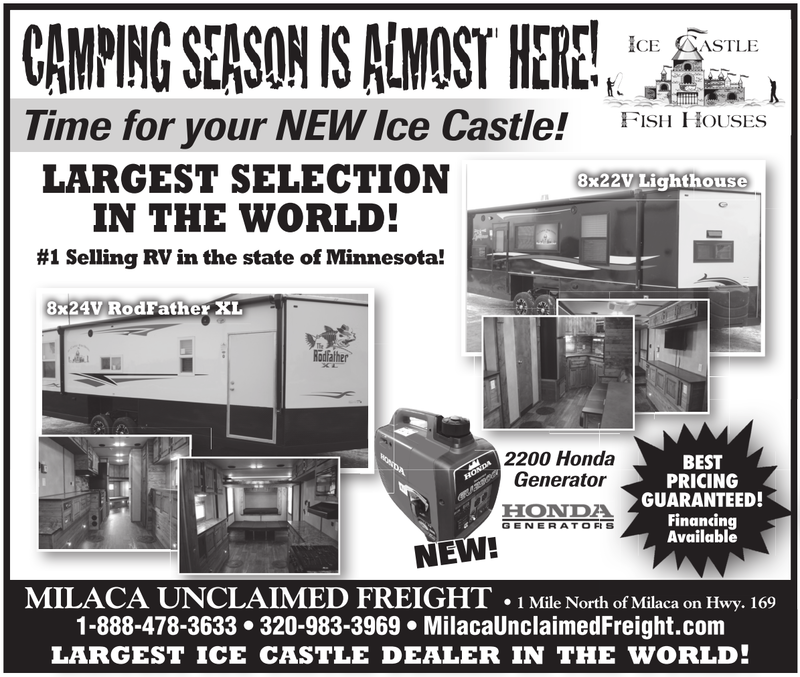 169 1-888-478-3633 • 320-983-3969 • MilacaUnclaimedFreight.com LARGEST ICE CASTLE DEALER IN THE WORLD! CAMPING SEASON IS ALMOST HERE! Time for your NEW Ice Castle! LARGEST SELECTION IN THE WORLD! #1 Selling RV in the state of Minnesota! 2200 Honda Generator BEST PRICING GUARANTEED! LARGEST ICE CASTLE DEALER IN THE WORLD! Go RVing In a New Ice Castle RV!